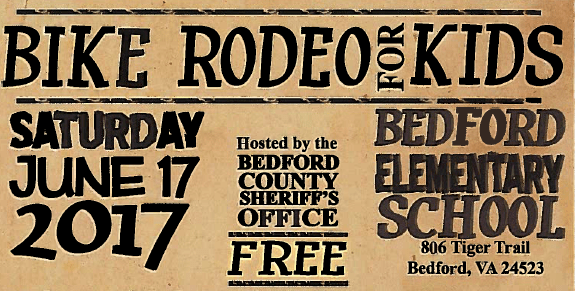 On Saturday, June 17, 2017 the Bedford County Sheriff’s Office is hosting a free Bike Rodeo for Kids. All ages are welcome!!!! Register here to let us know how many people to expect and pick a time slot. Blackwater Bike Shop will be doing helmet checks and bike maintenance. Pizza provided by Upper Crust Pizza. Riding instruction provided by certified bicycle officers and deputies. This event is designed to educate children on the importance of bicycle safety and proper riding habits. Participants will go through a series of riding courses to improve their control and safe riding ability.